Our staff of highly trained professionals works closely as a team to provide your healthcare services. Through the leadership of our Board of Trustees, Mt. San Rafael Hospital continues to make improvements to its facility, acquire new technology to improve services, and attract talented physicians to our community. We thank our Board of Trustees for their commitment to the healthcare of this community. We work hard to ensure we provide the highest quality healthcare in a personalized and professional manner. 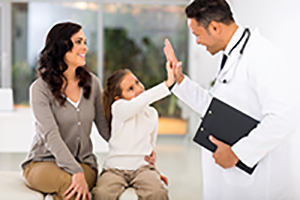 We always have patients and their families as our highest priority. And, we love hearing from you! "I've been in/out of clinics/hospitals and I have to say, I loved it. Mt. San Rafael Hospital has the most kind and understanding staff." "The radiology department is excellent. They communicated very well and I also returned in two weeks for a CAT scan and all the staff was just as pleasant the second time." "We are so fortunate to have a hospital in southern Colorado like Mt. San Rafael. I recommend it to everyone!" "I was very impressed with Dario San Roman, NP. He was very professional & most knowledgeable! If I ever get ill when visiting in Trinidad, I will definitely go back to this clinic." "I recently had a visit to the emergency room. The doctor was wonderful! He did everything he could to make me feel better & more comfortable. They were very apologetic for the wait times (which were super short compared to other hospitals!). Overall it was a pleasant visit." "The Dr. ordered a blood test for me and when I arrived at the clinic I was taken immediately. There was no wait at all. From start to finish, I don't think it took 15 minutes for them to check me in and draw my blood. Staff was excellent. They made my test a pleasant experience. Thanks." "I am a patient at the Rural Health Clinic. The staff and health provider did very well assisting me and others as quickly as possible. The nursing staff was friendly and helpful. Everyone was professional and informative and worked together as a unit. I'm satisfied." " Staff - very professional, clean appearance, compassionate. I thank all professionals for their services performed." "I love this place and my doctor! Everyone does such an amazing job. I've never seen anything quite like it. Thank you all for the courtesy you show patients and being absolutely professional at the highest standards. I'm very impressed. Don't let my doctor ever leave! Thank you all." "Everything flowed good! The doctor was very good! The nurse helpers did excellent too! A good experience! All this was a great experience, "the crew" did very good...I'll definitely advise people to "come your way!" "The emergency department was very good. I was having heart problems, and they took care of me right away." work very well, and efficient with each other. I am so happy with my health care team, that I just can't say it enough. I have been treated just like A VIP every visit. Dr.
Catherall is getting to know me and I'm getting to know her. That's the way it should be. I just can't say enough about how happy I am with my health care right now!! Awesome job, "EVERYONE "! I feel very blessed. I would tell, and have told, any of my friends to go Mt. San Rafael. Thank you ALL from the bottom of my heart!" "I recently had an emergency room visit and the nurse's interaction with my child and I was excellent!!! My child was scared and the nurses comforted her by giving her stickers and gloves blown into balloons complete with silly faces drawn on them. The doctor was smiling and had a sincere love in her voice. She took special care of my daughter. Her compassion was over the top!! The radiology staff was very sweet to my child and actually talked her into sitting still for 10 seconds for the image to be taken. I can't even get her to sit still that long. Y'all are the reason why my daughter asks to go to the doctor EVERY DAY now." nurse staff. I did not experience any delays or have any pain. Thank you to all the staff." "Everyone was extremely helpful and kind during our visit. We greatly appreciate all that you did for our daughter. My daughter was seen shortly after we arrived. We appreciate how quickly the staff attended to her!" "My husband and I have just moved from California to Santa Fe Trail Ranch. It is so comforting to know you have such a capable facility." "The surgical staff was outstanding. Everything was great!" "After having a quadruple bypass, I joined the Cardiac Rehab Program, somewhat reluctantly, at MSRH. I was quickly put at ease by Andres De Leon, RN, and his professionalism. I learned of the benefits and possibilities of a post cardio-bypass life. It is with great pleasure and gratification that I am able to recommend anyone that feels a need for excellent services that are offered in the Cardiac Rehab Program at Mt. San Rafael Hospital." "The ER nurses were awesome. I couldn't have asked for better care." "Having so many health problems, it's so nice to have some of the people there be so friendly when I have to come in for bloodwork or any other reason. I've gotten to know a few of the workers there because I have to get bloodwork done every month. Everybody is so nice to me and remembers me. I'm a hard stick, so they know that and do their best to get it the first time. The one lady is so good at getting a vein the first time. That is such a good feeling, knowing I don't have to get stuck more than once. They are always so friendly. I appreciate their thoughtfulness." "I was very impressed with the doctor and staff while I was in the Emergency Room, and everyone was kind and attentive to me. I was very comfortable with the staff and the doctor." "I am so pleased that we have the Mt. San Rafael Hospital Clinic. I think everyone there will help you if you need anything. Everything is clean and neat, and I always know I'm getting the best care." "The care and attention I received in the Emergency Department was fabulous! The same excellent care continued once I was admitted to the hospital, and my observation was that every patient received personal, compassionate care. The staff are to be commended for their knowledge, kindness and great attitudes, which made me feel important, safe and very well cared for. Thank you!" "This was my first visit to Mt. San Rafael Hospital, but I was very pleased with every phase of my operation. Since I don't live in Colorado, I won't be able to return. You have a very nice facility. I appreciate the outstanding job by Dr. Amy and her staff." "My visit to Mt. San Rafael Hospital was comfortable. Everyone was responsive and kind. The warm blankets were awesome. I received great attention in every area. I worked in the Emergency Department for 20 years, and it is a wonderful place to go when medical attention is needed." "I am 89 years old. I have lived out of Trinidad for 25 years, but I have been in this hospital three or four times. I've also been in a hospital upstate a couple of times, but I will honestly say this hospital has always taken such good care of me - and the food is great." "Quite frankly, I wasn't sure what kind of care I would receive in the E.R. I was very pleased with the staff and treatment I received. Dr. Sherick was outstanding and spent time with me, explaining what my diagnosis was. The nurse was attentive and caring. Truly would recommend your E.R. with no reservations." "The nurses took care of me right away and treated me with respect. I had injured my knee and they took care of it. The doctor was very nice and respectful and told me how to take care of it. I appreciate everything the staff did for me." "Mt. San Rafael Hospital is great, a very nice hospital to be in. Like I said, very, very nice people." "The doctor and nurses who took care of me were very good, explained everything to me and took care of me right away. They were the nicest people I could have ever had. Tom did an excellent job and got my wedding ring off without having to cut it off. I can't remember the names of the other nurses and the doctor, but they were most helpful." "I am a healthcare provider and have been in many facilities of healthcare across the country. I received excellent care and attention. My basic needs were met. I am very pleased to know Trinidad has a facility to treat the community. The nurses and doctors at Mt. San Rafael Hospital saved my life. I will be forever grateful." "The hospital was very busy and they had to deal with the same facility they have been in for a long time, but they did it cheerfully and efficiently. I was very satisfied but wish the area voters would have passed improvements to needed areas." "As a stranger in town suffering severe pain and nausea, the care given to me at Mt. San Rafael Hospital was speedy, effective and relieved my symptoms. Their diagnosis was thorough, complete and a printed copy was provided for my urologist. Medication was given to me to use if necessary and two prescriptions were written for my pharmacist. I was able to return to my hotel, sleep and return home the next day. The whole time at the Hospital was only 2 ½ hours. I was amazed that a little town like Trinidad, CO, could have such an excellent medical facility. Well done! And a hearty thank you to the personnel of Mt. San Rafael." "I was kept comfortable, my room was very clean and the Hospital staff were honest and good to me." "The operating room nursing staff was exceptional and the anesthesia staff was super!" "The nurses, Amy and Luke, were so kind that I remembered both their names. Thank you for the kind of experience you hope for! Kind Regards." "I cannot begin to express how thankful I am to the staff of nurses, doctors and emergency personnel at Mt. San Rafael Hospital for providing such outstanding care, not just to me, but to my small dog Boomer when we were involved in a traumatic car accident nearby. I couldn't have imagined being shown compassion and care to that extent and I will be forever grateful." "I visited the MSRH clinic on an acute care visit because my clinic was filled. The provider was concise, prompt and efficient about handling my problem. I am thankful the MSRH clinic accepts acute care patients who belong to another clinic on a walk-in basis. I would not hesitate to use or possibly become a patient of MSRH clinic in the future. "I was extremely pleased with everyone with whom I came in contact with at your facility. The admissions lady very kindly helped me locate my new insurance information and all others were more than kind and considerate. I was treated better at your facility than ever at any other. Thank you sincerely for your kind and personalized service." placement of my chest tube which was done at Mt. San Rafael Hospital. Good job! Thank you all for the excellent care." "My husband and I were on vacation when I got sick and I didn't know where to go so we went to the emergency room. Everyone was so nice and caring. They had me feeling much better by the time I left and I was taken care of immediately, no waiting. AAA+++"
"Everything was amazing; excellent service! My expectations were actually kind of low before staying at the hospital, but after, my opinion has changed dramatically. I was very happy with your facility and would recommend it to anyone! Also, Nurse Angela (night shift) was particularly helpful. She went above and beyond her duties." "I am totally pleased with the care I received during my visit to the ER. I was treated with respect and the entire staff was very professional. My visit was so refreshing compared to what it used to be. I couldn't have been more comfortable. Way to go MSRH! Five star treatment!" "Dr. Carter explained my diabetes better than any other physician I have had in the past. The classes provided by Elvira Martin were most helpful!" "The staff and physician were great and very kind to my sick four-year-old. One nurse even gave him a stuffed bear! Everyone was helpful." "I had heard mixed opinions about this hospital, but a few months ago when I had to be admitted, I felt very comfortable and I was treated quickly, not what I am used to when going to an ER. I was taken care of very well. They did what they could to meet my requests. I was very pleased with the care and respect I received from the hospital." "I was transported to your hospital via ambulance to the ER. When I arrived three women immediately took charge. Dr. McClintock took care of me and, as always, provided excellent care. The nursing staff was very competent and also demonstrated they cared about me and how I was doing." "Dr. McClintock (ER physician), and Dr. Reitter (general surgeon), and all the staff were professional and helpful in my emergency room visit. I would not expect to find better care or treatment anywhere else. My experience that day and any past experiences at your hospital emergency room have always been top notch. Thanks for caring for me and my family." "My husband was hunting in Colorado when he became quite ill with a respiratory problem. Dr. Stacey Porterfield was simply amazing. My husband has always had a strong gagging reflex and Dr. Porterfield was the first doctor to understand the problem, but also the first to have a remedy. He was very thorough, very informative, very thoughtful and took the time to explain where to get a prescription at a late hour. Without a doubt the best clinic physician we have ever had. Please extend our gratitude to Dr. Porterfield for a job well done."